Champa Devi is one of the best day hikes destination located to the south of Kathmandu valley, best for the short enjoyable hike. 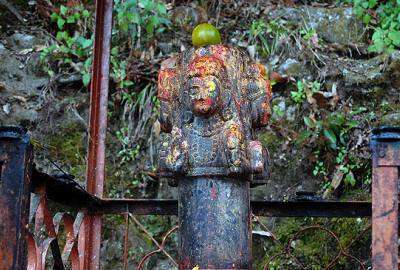 Champa Devi Hiking Tour start with one hour drive to Pharping Village (19 km) on the way to Dakshinkali temple (a temple of goddess Kali). Leaving the Pharping village, the trial directs us the way through the pine forest. Champa Devi Hill is situated at an elevation of 2,285m, having Buddhist and Hindu shrine on the top. After the 3 hours motivating walk, we summit the top. Enjoy the superb view of central and western Himalayan range including Langtang, Gauri Shanker, Jugal, Dorge Lakpa and many other. Apart from that you get the chance to admire the bustling Kathmandu valley and its dense settlement. Possibly the simplest ascent route follows the rough dirt road that skirts the Dollu valley (the one immediately north of Pharping) up to the Haatiban Height Resort. From the resort, a well-trodden track leads northwest up (and sometimes down) through pine forest, and then along the grassy ridge top to the stupa-marked summit (2285m). A return trip from the resort should take around 3hr. If you walk up from the Dakshinkali road it might take anything from 4–6hr, so bring food and water. A good alternative ascent route begins just after the Dakshinkali road makes an abrupt bend beyond Taudaha, climbing westwards along dirt roads through fields towards the edge of forest; at the trees, the trail turns southwards, and the last part of the route climbs steeply up through the forest to gain the ridge above Haatiban Resort, at about 2000m. Another route approaches from the south, following a dirt road up the northern side of the Pharping valley before turning off up the small Sundol valley; you can follow any of a number of trails up from here – all lead directly north to the summit of Champadevi. To avoid the road section of this Pharping route, however, you could also ascend the forested ridge that divides Dollu from Pharping; the trail begins at the monastery immediately west of the Bajra Yogini temple – it’s a bit tricky at the start as you have to find your way through a profusion of prayer flags and paths. From the summit of Champadevi, you can continue down and up to the unnamed western peak of the fishtail – which is actually slightly higher, at 2286m. You can then continue west along the ridge for an hour (or somewhat less), following a well-made path down to a saddle and then up to a higher peak (2509m). From here, another ridge tracks south for another hour or so up to the highest peak of the range, Bhasmesur (2622m) – said to be the ashy remains of a demon tricked by Vishnu into incinerating himself. West of the Bhasmesur spur, a path turns north off the ridge (though the actual ridge-line is confused around here – and the illegal charcoal-burning pits don’t help), descending a steep and seemingly endless stone staircase down to the village of Machegaon (90 min descent) from where various trails and roads lead back to Kirtipur. 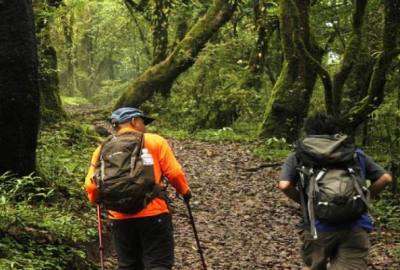 If you had the requisite time, weather, guide (or good map and route-asking skills) and fitness, you could also trek west along the ridgetop from the Bhasmesur spur to a col at Deurali, and then on west to another pass at Chitlang Bhanjyang, from where a dirt road descends to Thankot, on the busy Prithvi Highway (the Pokhara road); it would be a very long day.